It's happened more times than I care to admit. I'm just running along, lost in my thoughts or my music, when all of a sudden my feet go out from under me. Maybe it's black ice or maybe a crack in the sidewalk. One time it was a sprinkler head, buried in the grass. Sometimes it's just been my feet. Before I hit the ground, there's that moment when time stands still. Where the thought "oh, sh*t, this is going to hurt" crosses my mind. Then crash! I land on my back, my knees, my face. Most of the time, when I have fallen, I haven't gotten hurt badly. Once after a particularly dramatic spill, a guy in a car stopped and asked if I was ok. Ashamed, I just waved him away. There was also that incident when I tripped over the curb on the way into Target and fell face first into the bike rack. That stunt bought me an ambulance ride to the ER, a concussion, and 5 stitches in my eyelid. This winter, I've had a few close calls with black ice but each time I was able to stay upright. I was shocked every time. Was it luck? Or was it some kind of skill? Or am I becoming more nimble in my old age? Kinesthetic awareness is the technical term for awareness of your body in space. Some people are born with it. Some of us, ahem, have to work a little harder at it. Toddlers have a lack of kinesthetic awareness. When I see toddlers in the clinic, parents often are concerned about the amount of bruising they have. I do my best demonstration of a toddler walking, focusing on a point across the room, a toy or whatnot, instead of looking at the floor. While my antics always get a laugh out of the parents, the point is made. 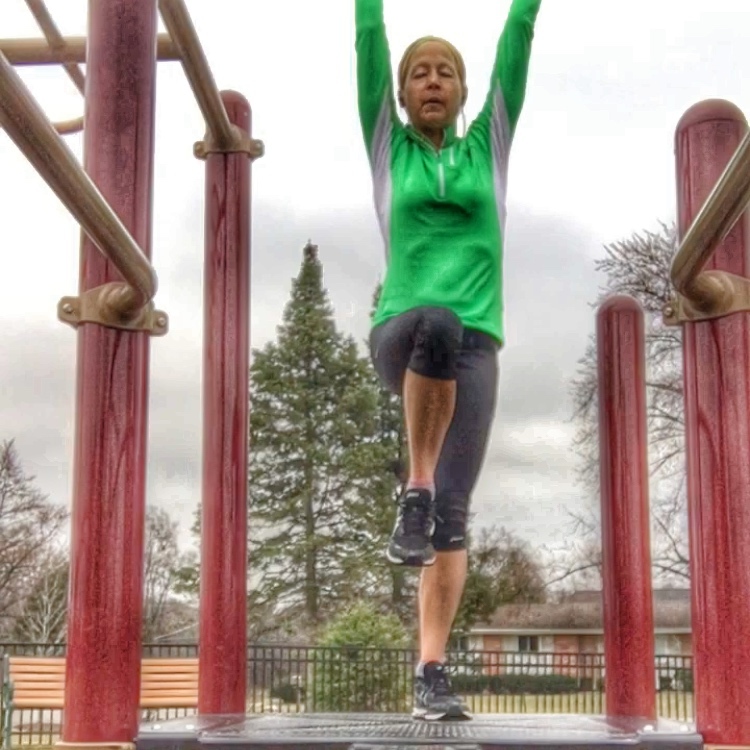 Many runners run like toddlers. Focused on our goal ahead, shoulders back, eyes forward, we don't always see obstacles on the ground. Which is a recipe for a wipeout. Have you been called uncoordinated? I was that child who was politely told that maybe dance wasn't my best skill. I'm that adult who has to be re-taught the electric slide at every party. When I workout with Becky, she has to break down every exercise for me, step-by-step. It took me forever to learn to do carioca, which is a standard warm-up for many athletes. When I told my teenage son I was struggling with carioca, he rolled his eyes. I knew I needed an intervention. 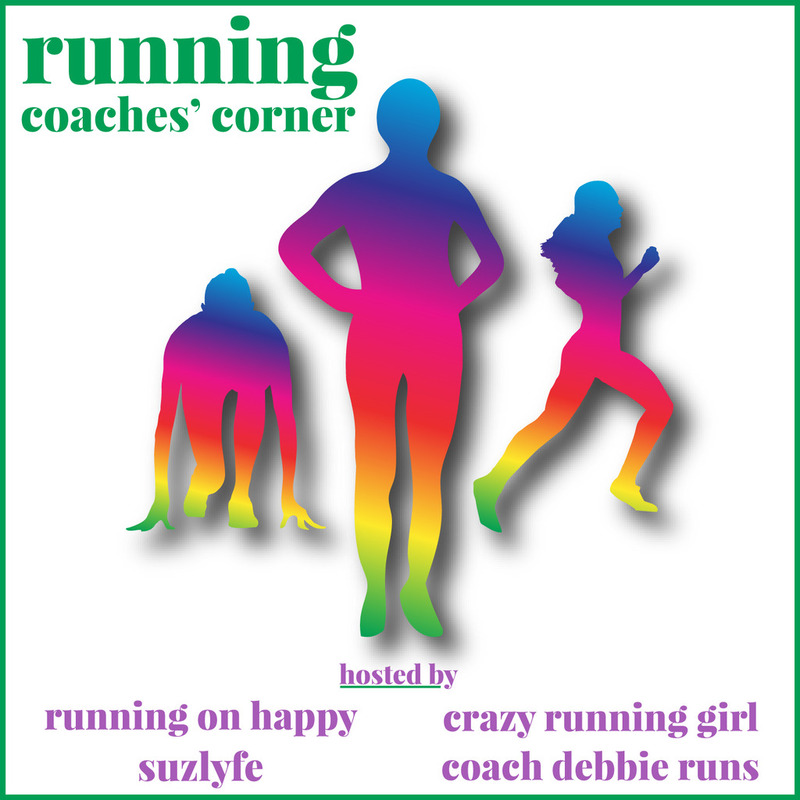 I share a lot about running and yoga on the blog, but I don't talk as much about some of the nuances of my training with Becky. While I do a lot of balance poses in yoga, Becky works with me on balance exercises as well. I might moan and groan when she pulls out the Bosu, but working out on an unstable surface forces me to engage my core and maintain balance. She also employs these techniques when I am strength training, by dangling kettlebells or chains from the barbell. Balance poses challenge your equilibrium. 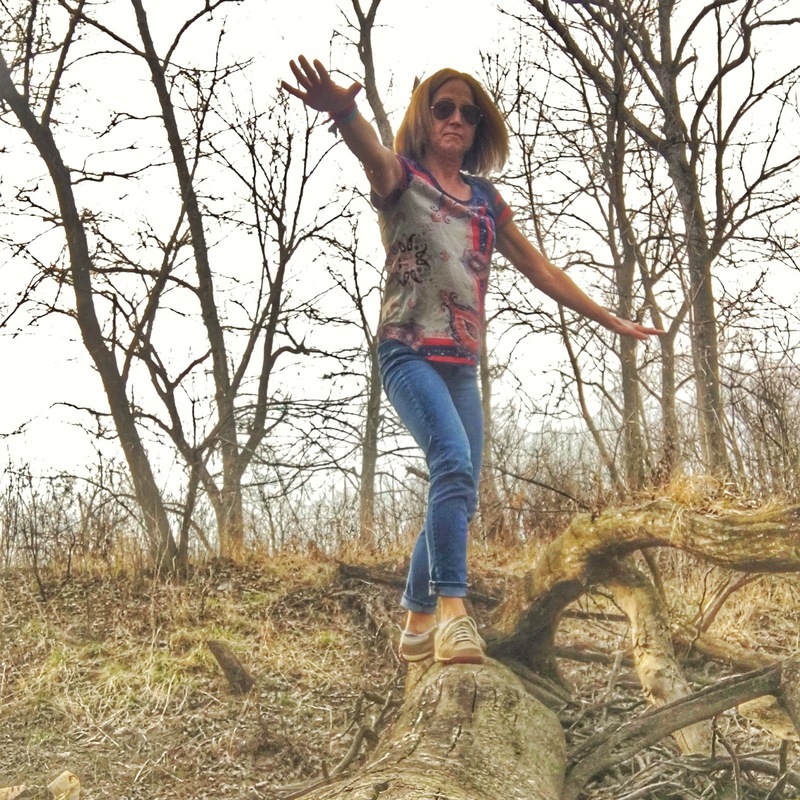 While I was preparing this blog post, I asked Becky for some examples of activities that help with kinesthetic awareness. Balance exercises were on the top of her list. 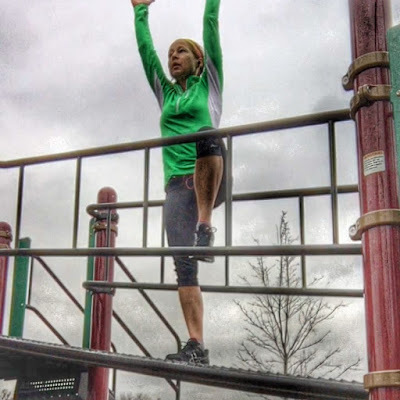 She also suggested changing it up by doing the balance exercises with both feet, one foot, eyes open, eyes closed, even surface, uneven surface, without upper body movement, and with upper body movement. You can use a wall until you become more comfortable with these activities. Any yoga balance pose will work. Here I am in one-legged knee-to-chest pose, which is a simple yoga balance pose. Try these and share your results in the comments below. When attempting kinesthetic awareness work, make sure to tighten your core and breathe! By tightening your core, it forces you to improve your alignment and stabilize your body position. There's more to a tight core than just a bikini belly! Tight core would have held this one up! By improving your kinesthetic awareness, you will lessen your chance of injury as your muscles and your brain will know how to react when you are thrown off balance. Eventually, you won't even have to think about it, you'll just do it. I don't land it every time! It's been really interesting and fun to shake off that self-image I have of being uncoordinated. I can do yoga balance poses and I can kick up into handstands now. Don't get me wrong, I'm still working on those dance moves. Becky still has to demonstrate an activity multiple times to me before I get it. On terra firma, I got Warrior2. On a tree trunk? Not so much. One thing is clear: greater kinesthetic awareness leads to improved function and fewer injuries. As I always say, runners can't live by running alone. 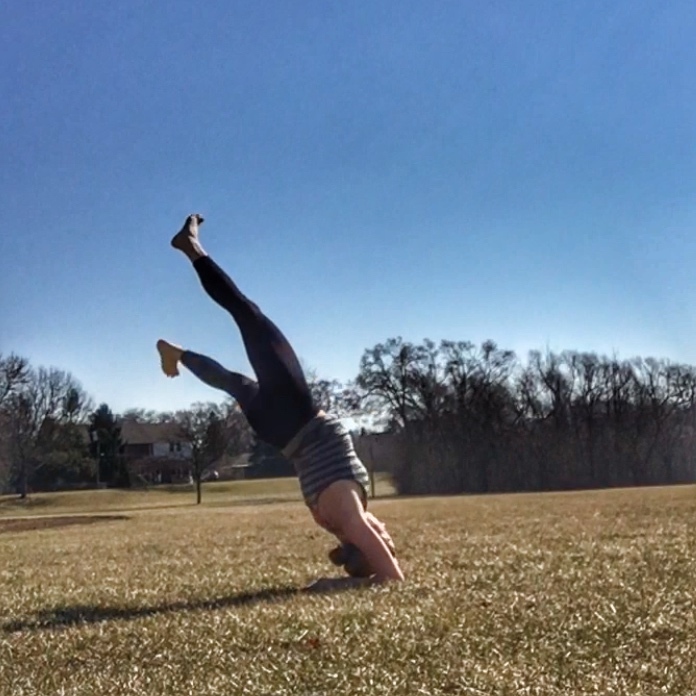 Balance and stability will continue to be a work in progress for me, but staying upright is always a win. I'm linking this post up with DebRuns for her monthly Wednesday Word, which today is Nimble. 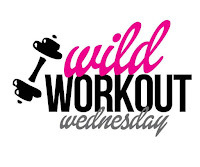 I'm also linking up with Debbie, Susie, Lora, and Rachel for Coaches' Corner as well as Nicole, Annemarie, and Jen for Wild Workout Wednesday! This this this is entirely why I got back into my yoga practice. I have a friend and we walk together for about an hour three times a week. Especially gearing up for this marathon. Today she was horrified how I could trip/almost fall over virtually nothing. People always ask me why I run in the road and the answer is simple: the surface is even. Haha!! I immediately thought of my son when I started reading this post! And I've recently added balance (and ankle strengthening) exercises to the routine. My trainer said my ankles are wobbly, which is hurting my knee and hips....so we're working on it. And balancing on one foot on the Bosu ball is one of the moves...along with straight up/straight down calf raises. The Bosu really challenges me! I'm thinking of purchasing one because I think I need more of it. love this! i've definitely got to get back into yoga... even just for a short time a few times a week - it makes everything else feel so much more in balance! Yoga helps running so much more than we think! You'd be surprised how often I fall out of a pose. The outtakes are always fun to look at! I've added more core exercises and Yoga into my workout routine. I haven't seen any improvements yet but I know it takes time! I do think I've gotten more nimble as time has gone on but my other issue is that I get distracted very easily..I have to work on being more mindful too. I love my outtakes! LOL! I'm pretty sure that the workers who were in the park when I was doing this were entertained as well. 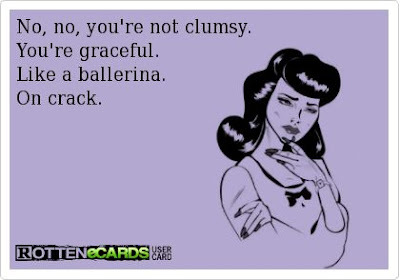 Ohhhh I am so clumsy too! I've been pretty lucky (knock on wood) while running (only fallen a few times) but I seem to trip, fall, run into stuff all the time outside of running. My Mom put me in dance to help with my clumsiness.... and I just ended up being a clumsy ballerina! Exactly the opposite. When I think of you. I say nimble. I am in awe of your yoga poses. I can do a single one. I have fallen many times running...Yes I am clumsy. Practice, my friend...it really does work! Not graceful. I can "appear" to be graceful, but let's be honest--NO. Case in point? My ice pratfall the other week! No balance here. At all. You would fall down laughing if you saw me attempt balance poses in yoga class. Tree? How about a low-level bush? Not even with my foot on my calf. Hopeless. Not hopeless! It's a goal, right? I definitely have to work harder for it. I notice in classes like barre and yoga if they tell me to point or flex my feet I have to look, I can never tell by how they feel what they're currently doing. I think we embody what we practice and focus on. You know what my background is (figure skating with tons of dance training, yoga, martial arts) so yes, kinesthetic awareness is there....as long as I keep practicing it. Does that mean I never fall? Nope. It's nice that you have that ingrained in you--I think it's so important to get kids involved in physical activities early on. For the obvious reasons, of course, but also for the subtle things. Like staying upright. I can't do the Electric Slide. I feel like Elaine on Sienfeld when I dance. Sadly, The Hustle is about as good as it gets. Bahahaha. You'll be proud of me. 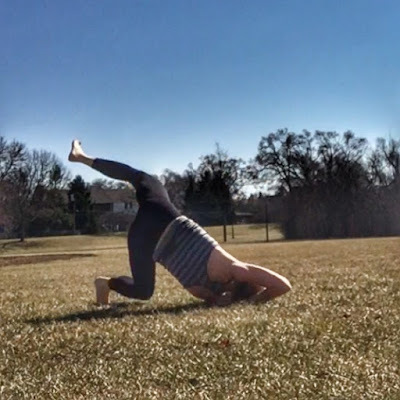 I did yoga this week! I swear. I was good on the athletic field, but I'm klutzy in "real life." I do have to work on my balance, and one thing I want to get is that balance disc. I used it in PT, and I think that would help strengthen my ankles and calves. 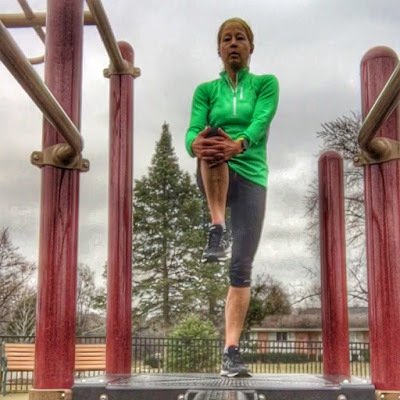 I was surprised at how hard it was to stand on the Bosu! I think I need one too. It sounds like you have had some painful falls! I fell a couple times trail running but nothing that really hurt. I only remember falling once on the road and it was just one of those dumb tripping over nothing things! I just had to come back and inform you I jinxed myself. I ALMOST FELL THIS MORNING over a huge rock!! I haven't fallen much running, thank goodness, although the one (two, really, twice on one long run) was pretty spectacular (but thankfully no serious injuries) -- yes, a stranger stopped to see if I was ok, too. Which does not mean I'm very coordinated, either! Some days I can balance, some days I totally can't! But I do work at it. Staying upright is always a work in progress! I am SO unaware and I do work on it but it's frustrating to work on it so then it's easy not to do. I learned a lot of this from my PT and try to take time to practice during yoga. I have fallen more times than I care to admit (both running and not running)...let's just say I am a "always hang onto the handrail" girl when I am coming down stairs. I really don't trust myself (for good reason). A girl after my own heart! We can hold each other up. In our household we have spectacular and we have frequent. I'm the frequent - I trip over my own feet, have bruises that I have no idea where they came from, knock stuff over, etc. My husband does the spectacular - bike crashes that require a helicopter ride. Lucky for us the spectacular are not frequent. I think I'd rather be the frequent! Yikes! Well, my big fall a couple of months ago was tripping over a crack on the sidewalk, so nimble I'm not...what I really need to learn is how to fall gracefully! It's so funny, in those seconds before I hit the ground, I think about how I'm going to land and turn my head. My dental work! I have definitely noticed a difference! Ha ha ha! I love your bike rack story. I have a similar one! I was leading a running group for the Vancouver Sun Run (a huge 10k race up here with over 50,000 people). 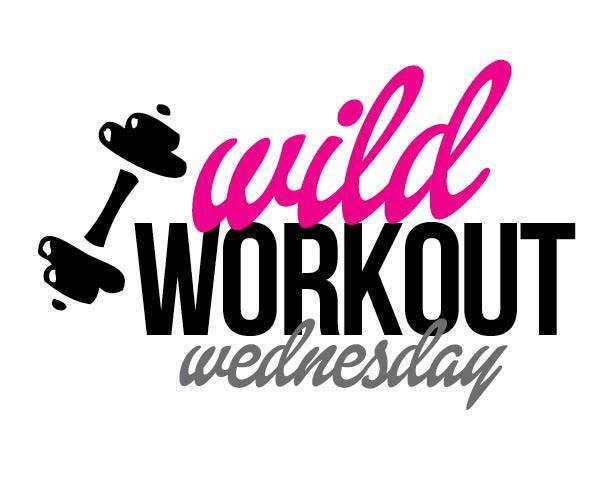 The group had about 40 people in it, and I was walking backwards out of the rec centre, my hands cupped around my mouth, giving them some directions about our workout when I walked backwards and into and over a bike rack, and I wiped out HUGE all over it and onto the cement. IT WAS HORRIFIC. And hilarious. You are quite deceiving with all of your yoga pose pictures. I would have never guessed! The outtakes are pretty epic, right? I feel geriatric when I do carioca--I'm so slow! I like your analogy to toddlers. I almost wiped out on the bridge the other day. I always run east on the bridge but this time I was running west. There was a lip on the sidewalk that I didn't see and I went flying. I didn't fall but I wonder what the people driving by thought! That Target spill sounds scary. There's just so much to think about when we're running, and the danger lies in not thinking at all! Great post! I am kinesthically unaware for sure and my injury track record proves it. I'm heading out in a bit and our sidewalks are dusted with snow. Wish me luck! My kinesthetic awareness varies with different activities, and as I mention in my post, sometimes it's not so good! Thanks for linking up, Wendy! Great post! I miss your word prompts! This one was fun. I find that being in OR nurse I need to be kinetically aware all the time. I need to know exactly where the sterile field is, how close i am to it, what is behind me equipment wise as I move around the room. I also find yoga has really helped me as well. great post! It's interesting. I've got really good balance, but I constantly walk into things or trip over my own feet. Odd. I attribute the balance to dance. The rest of it, well... I do what I can. I think dance is so helpful--if you can do it! I agree--I feel like a kid when I'm trying all the balance poses! I can definitely be clumsy at times. I could use a little more balance work! It's all about the core. Something tells me you'd be a natural! Mostly I end up with skinned knees. With an occasional cracked kneecap thrown in. :-). I was lucky today (yep), when I tried to catch myself and landed hard on my hand, that I didn't break my wrist. Okay, maybe I'm not so balanced! You're such an inspiration! love that photo with you and the barbell and chains. I do need to do more balance exercises. I'm an embarrassment in yoga classes - legit the only one falling all over the place lol.